Humbucking pickups take their colloquial name from the fact that they’re designed to reject hum that can be induced from electrical sources. They can also be called double-coil pickups (as opposed to single-coil pickups), because they achieve this noise reduction by pairing together two coils wound in opposite directions. When the + and – of these two coils’ signals are combined, the hum is canceled out, but the guitar sound remains. Humbucking pickups hit the ground running in the mid-’50s, when first Gibson and then Gretsch released their renditions of the design. The width of the two coils paired side-by-side in most traditional humbuckers also influences their sound, because it presents a wider magnetic window, as it were, which senses a broader sample of the strings’ vibrations. This, plus the combining of the signals from two coils, tends to lead many humbuckers to translating a fatter, warmer sound from your guitar, although most better examples also have more than enough brightness. 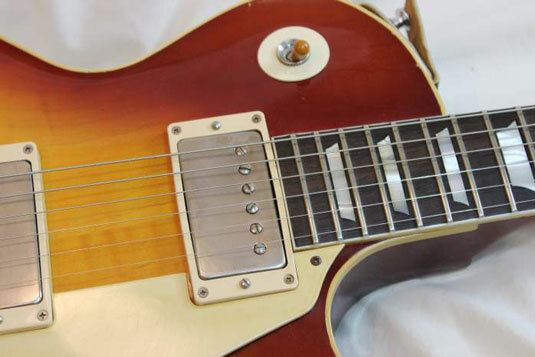 Following are a couple of the classic humbucker designs according to the manufacturer that originated them (which tend to have less variety, outwardly, than single-coil pickups, as so many makers have followed the Gibson template in the years since). Be aware, too, that countless renditions of each type are available today from other replacement-pickup makers, in styles that range from precise vintage re-creations to modified and hot-rodded units. Introducing its full-sized humbucking pickup on the Les Paul Custom in 1956 and Les Paul Standard the following year, Gibson established the most legendary unit of all time. 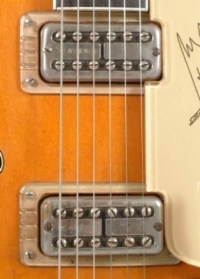 These pickups (often called PAF for the Patent Applied For sticker found on the bases of examples from the late ’50s and early ’60s) are made with narrow side-by-side coils, with an Alnico bar magnet mounted below and between them, threaded adjustable steel poles in one coil, and fixed steel poles in the other. They have a rich, warm sound but are capable of excellent clarity too, with a bite that works great for rock lead playing. Gibson is also known for its similarly constructed — but smaller and brighter — Mini-Humbucker, as well as the Firebird Mini-Humbucker, a unit with an individual Alnico bar magnet within each of its two coils. At the request of guitarist Chet Atkins, engineer Ray Butts developed a humbucking pickup for Gretsch in the mid-’50s that replaced the DeArmond single coils in many of the company’s upmarket guitars thereafter. The Gretsch Filter’Tron (named for its ability to filter out electronic noise) has two tall, narrow coils side by side with adjustable threaded steel poll pieces in each. In true Gretsch form, it has a brighter, tighter sound than the bigger Gibson humbucker, with somewhat less output, keeping it sounding cleaner in most amps. Popular in the wake of the full-sized humbuckers, several pickup makers began developing means of obtaining hum-free performance in units that would fit into guitars originally made with narrow Fender Stratocaster- and Telecaster-style single-coil pickups. These have mainly taken the form of stacked humbuckers, where the two coils are placed one atop the other, and side-by-side blade humbuckers, with one thin steel blade pole in each of two narrow coils. 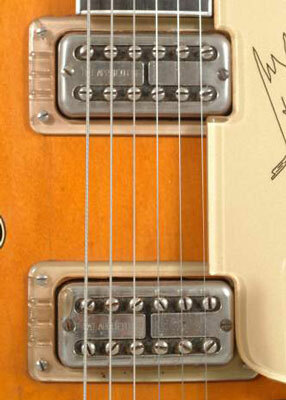 Similarly, several makers also offer dual-coil stacked and side-by-side pickups in P-90-sized mountings.